One of the greatest illusions in the world causing most of the devastation we see today is that we are separate from all the forests and all the oceans, that we are separate from all other life on Earth. That we are superior to nature. But the reality is we are part of nature. That above all, we are nature. It can be difficult to understand or remember that we are completely connected to nature because we live in concrete jungles masking the surrounding Earth in a society where products and services continuously replenish inducing the illusion of endless abundance and whose general culture is built on the assumption that we are detached from the natural world with complete dominion over this world and all of its inhabitants. We've evolved incredibly as leaders of the biosphere, but we are largely misleading by living in disharmony from the very foundation that makes our lives and all we do within them possible. Beyond our stunning technological and intellectual advancements, we can clearly see our devastating impacts to the furthest corners of the Earth. Healing the lands and oceans, improving our health and well-being, protecting wildlife and giving our children the future they deserve begins with the inspiration, awareness and knowledge to do so. The impacts of climate change and environmental damage are often observed at a direct level, whereby sea-level is measured or temepratures monitored. 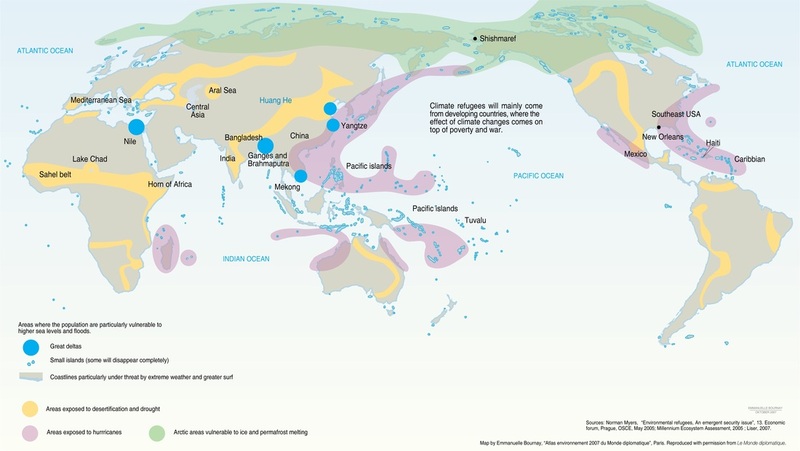 This map however illustrates how the environment will have far-reaching consequences, with dramatic changes to the migratory movements of people and forced displacement as a result of the change in climate and environmental conditions. Click to enlarge and for sources. Global warming has already had observable effects on the environment, such as shrinking glaciers, earlier break up of ice on rivers and lakes, increased droughts, intensifying extreme weather and plant and animal ranges shifting. Without effective action to halt the burning of fossil fuels and reduce the levels of greenhouse gases released by human activity, humans and wildlife worldwide face an unwelcoming future. There will be increased disruptions to society from extreme weather, with more frequent flooding and storms, more severe droughts and heat waves, rising sea levels and warming permafrost. In many regions, the effects of water shortages and extreme heat will adversely affect agriculture and the effects on the natural world will be severe with a major loss of coral reefs as oceans warm and to tropical forests as fires become more frequent. These impacts will also be felt enormously in economic terms. The cost of doing nothing and continuing our trends will severely oppress world financial systems. Global environmental damage resulting from human activity already costs the world’s economy, according to the United Nations, $6.6 trillion during 2008, equivalent to 11% of global GDP, and $7.3 trillion in 2009 (see also), equivalent to 13% of global economic output for that year. This is the natural capital being consumed, depleted or degraded without a responsible party paying for it - known to economists as 'negative externalities'. Consequently, these costs are being passed onto society and nature. By 2050, this annual amount is expected to jump to $28 trillion, which is 18% of GDP. There will be many social consequences with mass human migrations from lands affected by drought or famine and extreme heat stress in the urban areas of tropical and subtropical countries. The scientific consensus regarding climate change is based on the work of thousands of experts from hundreds of research institutions located across the globe. Scientists worldwide have considered all the possible natural factors that affect climate on Earth, from the output of the sun to the effects of volcanoes. After decades of analyzing the possible impacts on both warming and cooling by each of the natural and man-made factors, the scientific consensus regarding climate change has grown clear and strong that human activities are the main drive behind the warming. From cavemen sparking fires to leaders of our biological community, we have accomplished amazing feats and developed incredibly as a species. It is now time to continue our remarkable advancements, but with mother nature, not against her. For if we do not change many of our destructive ways, the changes will be forced upon us by a degraded, unstable biosphere - rapidly, destructively and without discrimination. Empower your mind to the challenges our society and natural world face and discover the actions you can take today for a better tomorrow. We need to get below 350ppm. "Research now demonstrates that the continued functioning of the Earth system as it has supported the well-being of human civilization in recent centuries is at risk. Without urgent action, we could face threats to water, food, biodiversity and other critical resources: these threats risk intensifying economic, ecological and social crises, creating the potential for a humanitarian emergency on a global scale. In one lifetime our increasingly interconnected and interdependent economic, social, cultural and political systems have come to place pressures on the environment that may cause fundamental changes in the Earth system and move us beyond safe natural boundaries. But the same interconnectedness provides the potential for solutions: new ideas can form and spread quickly, creating the momentum for the major transformation required for a truly sustainable planet. The defining challenge of our age is to safeguard Earth’s natural processes to ensure the well-being of civilization while eradicating poverty, reducing conflict over resources, and supporting human and ecosystem health. As consumption accelerates everywhere and world population rises, it is no longer sufficient to work towards a distant ideal of sustainable development. Global sustainability must become a foundation of society. It can and must be part of the bedrock of nation states and the fabric of societies." Pressures on the planet’s ecosystem are now so great that future generations could face falling living standards. The population is expected to increase from roughly 7 billion people today to more than 9 billion in 2050. The global economy is expected to recover from the financial crisis and ultimately quadruple in size. However, the financial cost of failing to address climate change could result in an up to 14% loss in per capita consumption worldwide by 2050, according to some estimates. Pollution will become the biggest cause of premature death, killing an estimated 3.6 million people per year by 2050. Air pollution alone will be a major killer, overtaking both poor sanitation and a lack of clean drinking water as a global health threat. Due to dependence on fossil fuels, carbon dioxide emissions from energy use will grow by 70%, the OECD found. This will help drive up the global average temperature by 3° to 6 ° Celsius by 2100. Not only does this far exceed the internationally agreed-upon global warming limit of two degrees, but three degrees may be the “tipping point” where climate change could run out of control, scientists say. Because the population will grow so dramatically, there will be a 55% increase in demand for water, and 40% of the world’s population will be living under severe water stress. Groundwater depletion will be the biggest threat to agriculture and to urban water supplies, while pollution from sewage and waste water—including chemicals used in cleaning—will put further strain on global water supplies. Biodiversity will decline by 10% on land, with the worst impacts felt in Asia, Europe and southern Africa. According to a World Health Organization analysis of 192 countries on the impact environmental factors have on human health, reducing environmental risks worldwide could save 13 million lives every year. Learn more. Half the world's population could face a shortage of clean water by 2080 due to climate change. The U.N. Intergovernmental Panel on Climate Change found that as many as 2 billion people won't have sufficient access to clean water by 2050. That figure is expected to rise to 3.2 billion by 2080 — nearly tripling the number who now do without it. Learn more.